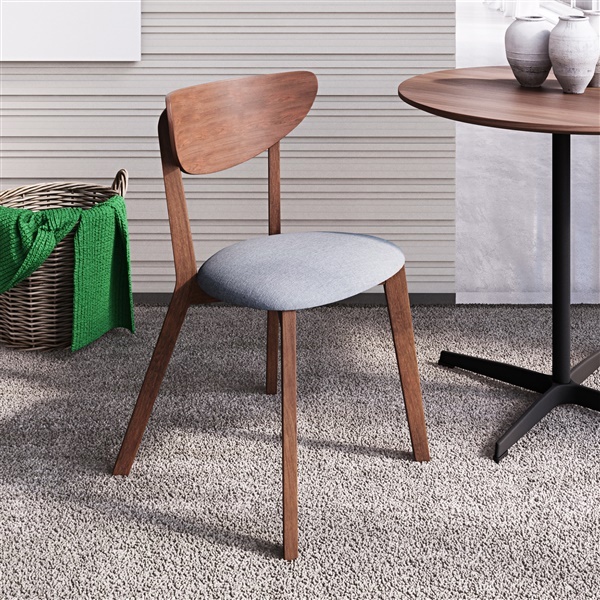 An organically shaped seat & back and a sleek angled frame define the Anton Dining Chair as distinctly Scandinavian in design. Its solid wood frame offers a lightweight but equally durable construction you can rely on for years to come, and is finished in a beautiful walnut stain. Its seat cushion offers comfort and support, and is upholstered in an easy-to-clean, ultra-stylish gray tweed-like polyester, which offers a classic mid-century appeal. Assembly was a piece of cake, design is nice, quality is up to par, no complaints whatsoever! love them! I will be back for sure! Something about these chairs really does it for me but I can't quite pinpoint what it is! All I know is that I LOVE THEM and they ARE GREAT LOOKING! In a nutshell, I'm completely satisfied with my order and I will DEFINITELY be shopping here again in the future! love the chairs, love inmod!! wood finish matched!! Thrilled!! Fast shipping & great customer service - I will be back here again! LOVE MY NEW CHAIRS! I have crescent shaped accents on the leg design of my dining table and i couldn't BELIEVE i found a chair in the exact same wood finish with the exact same crescent shaped backrest - seriously, it was like they were made for one another - ECSTATIC!